New Egypt Speedway is the last surviving dirt track in New Jersey. It is also the only track to host both of the Outlaws touring series. The 7/16-mile D shaped clay oval is a tough nut to crack. In 1978, this was the first track that Steve Kinser won on; he also won the last Outlaws race held there in 2005. 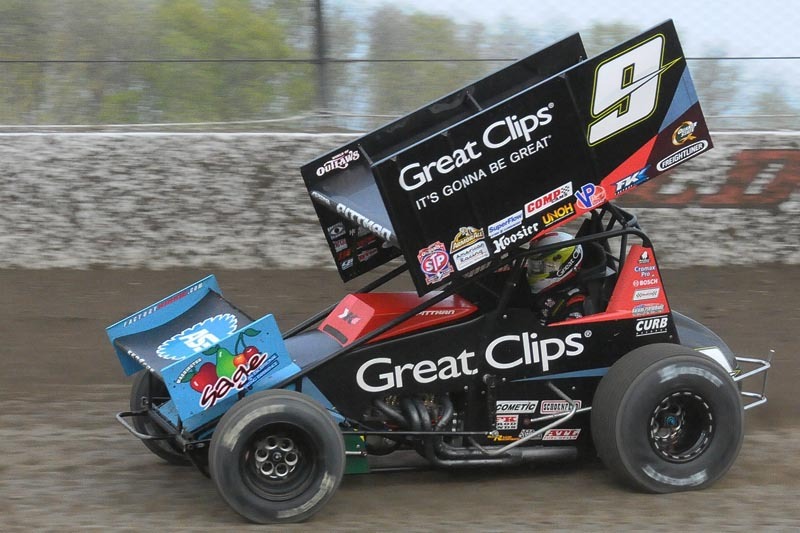 Last night the winner would come from a new generation of drivers when Daryn Pittman took the double checkered flags to claim his fourth win of the season. The field was 33 cars strong and the track record was 12 years old held by Joey Saldana. On July 30, 2001, he turned a lap of 13.828. Last night the track record would fall to 17 out of the 33 cars who qualified. 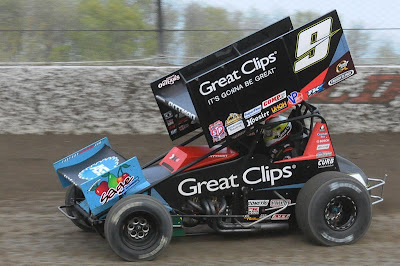 In the end, the fastest and new track record holder would be Daryn Pittman who turned a lap of 13.396 or 117.070 mph. The rest of the top 5 were Kraig Kinser, Paul McMahan, Tony Stewart and Donny Schatz. The four heat races would be run on a very fast and very narrow track that was, according to drivers, too wet. The cushion or the top of the track was only about half way up the track making the racing surface about a groove and a half. By the time the third heat was run, the cushion was becoming very choppy and rough as it moved up the track. The first heat race was won by PA Posse standout Greg Hodnett who was chased to the line by Donny Schatz, Daryn Pittman, Justin Henderson and J.J. Grasso. Hodnett took the lead on the green flag and was never challenged for the lead. The real racing went on for the second and fourth spots with Schatz and Pittman dueling hard all the way around the track. Grasso would pressure Henderson but could never get up beside him for the fourth spot. The second heat race was won by Joey Saldana in the Motter Motorsports No. 71M. The rest of the A Main transfers were Sammy Swindell, Cody Darrah, Jessica Zemken and Steve Kinser. On Lap 2, Kraig Kinser got into the back of Zemken while trying to make a pass and damaged the front suspension of the car. He would finish last in the race losing his Dash on time position. The third heat race was won by new comer and central PA Posse member Ryan Smith who held off a hard charging Jason Sides, Chad Kemenah, Paul McMahan and David Gravel. Gravel and Kerry Madsen would battle back and forth while exchanging the final transfer spot four times before the checkers flew. This would give the spot to Gravel and relegate Madsen to the Last Chance Showdown. The final heat race was won by Craig Dollansky who won the race with a straight away lead over third place. Coming home second was Tony Stewart who finished 1.9 seconds behind the leader after battling with Lance Dewease who was passed on the final lap by Logan Schuchart. The final transfer to the A Main was Mark Bitner, a modified stand out that was making his Outlaws debut last night. The Dash draw was a six (6) putting Jason Sides on the pole for the race. Starting to his right was Sammy Swindell. Sammy took the lead on the green flag and walked the dog on the field taking the Dash win by 2.9 seconds. Sides came across the line second after a hard fought battle with Daryn Pittman who came home third. The Last Chance Showdown was indeed the last chance for two regular Outlaw competitors. Both Kraig Kinser, who started on the pole, and Kerry Madsen, who started 12th, were out of provisionals and they would have to race their way into the A Main. For Madsen that was a tall order on the wet narrow track. When the Showdown went green Kraig Kinser jumped out to the lead and ran away from the field. The race would be for the final transfer spot between Brent Marks, Davey Sammons and Kerry Madsen. At one point Madsen passed both Sammons and Marks on the low side in Turns 3 and 4 but did a wheel stand with the car and then bicycled for a moment allowing both Marks and Sammons to get back by him. Madsen was never able to regain the spots to advance to the A Main. The Showdown would be won by Kraig Kinser by a half lap advantage. The rest of the transfers were Robby Stillwagon, Ryan Bohlke and Brent Marks. The A Main was 30 laps in length and took place after the track was grated in an effort to widen it out. Sammy Swindell, who was making his New Egypt debut, would take the early lead but lose it in traffic to Daryn Pittman on the fourth lap. Pittman would pull away from Swindell who would damage the nose wing of the car when debris would come up off the track breaking a bracket. Jason Sides and Tony Stewart would battle for third all the way to the checkered flag with Donny Schatz joining the mix to take them three wide on the back straight away. Sides would prevail and come home third while Stewart had to settle for fourth and Schatz fifth. The hard charger of the race was J.J. Grasso who advanced six spots from 17th to 11th. Sides would have a fuel leak in the car during the closing laps of the A Main and would exit the car soaked in fuel. As a result, he was unable to be on the podium due to safety concerns with the fuel. The Outlaws will begin the trek from New Jersey to North Carolina where they will take on the Dirt Track at Charlotte. There are all kinds of personal appearances and special dates for the fans in Charlotte this week. From winged go kart races to driver appearances and autograph sessions. The Outlaws home office is in Charlotte so in a way they are going home. Last year, Joey Saldana took home the prize on national television. This year, there is no live coverage but the race at Charlotte is always a big deal. New Egypt is quiet now. She has been left alone with her thoughts and memories. Her pages are full and the cheers of her stands echo along with the sound of the 900 horsepower Outlaw engines. The moon caresses her clay curves and smiles, it is time to sleep and dream of sprint cars with wings and young men who became and would become Kings. Heat Race 3 Results: 1) Ryan Smith 2) Jason Sides 3) Chad Kemenah 4) Paul McMahan 5) David Gravel 6) Kerry Madsen 7) Robby Stillwagon 8) Kyle Reinhardt. Heat Race 4 Results: 1) Craig Dollansky 2) Tony Stewart 3) Logan Schuchart 4) Lance Dewease 5) Mark Bitner 6) Bill Rose 7) Jason Leffler 8) Ryan Bohlke. A Main Results: 1) Daryn Pittman 2) Sammy Swindell 3) Jason Sides 4) Tony Stewart 5) Donny Schatz 6) Joey Saldana 7) Paul McMahan 8) Greg Hodnett 9) Craig Dollansky 10) Kraig Kinser 11) JJ Grasso 12) Lance Dewease 13) Steve Kinser 14) Ryan Smith 15) Cody Darrah 16) David Gravel 17) Logan Schuchart 18) Chad Kemenah 19) Justin Henderson 20) Ryan Bohlke 21) Jessica Zemken 22) Mark Bitner 23) Brent Marks 24) Robby Stillwagon. Hard Charger of the Race: J.J. Grasso from 17th to 12th.